Technology Adoption projects provide timely and objective assistance to manufacturers when implementing high-impact, high-return projects within and across their manufacturing value chain. 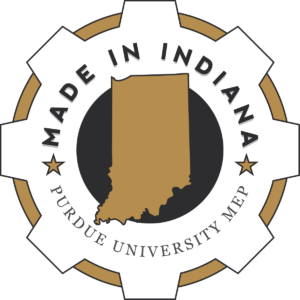 Technology Adoption projects are delivered by Purdue faculty experts through our partnership with Indiana’s Manufacturing Extension Partnership (MEP). Let us help your Indiana based operation be more efficient and profitable by implementing smart, digital technologies. Through our network of expert faculty and professionals we can help you identify the opportunity, scope the project, and implement a high-value, high-return solution. Production Systems Modeling and design, including factory flow optimization and layouts, data intelligence, line simulations and warehouse systems. We are accepting inquiries for technology adoption projects. The IN-MaC award will provide up to $40,000 in most projects to offset the consultative services of Purdue expert faculty and students. Participating companies demonstrate a minimum investment of half the IN-MaC-invested amount through in-kind contributions (the dollar value of participating personnel) and expenditures (software, computers, etc.). IN-MaC grants favor high-impact, high-return projects with demonstrable outcomes. Project outcomes are estimated before a project and are verified after completion. Impacts are reported in terms of improvements to operational performance, increased revenues and other factors. Projects are typically 3 to 6 months in duration. The IN-MaC grant cannot be used for Capital equipment, computing hardware or software. We are beyond pleased with the outcome of our IN-MaC experience. Purdue has drastically expanded the capabilities of our engineering department, and we are now able to provide some of the most sophisticated engineering services of any bellows manufacturer. The technical expertise and quality of the Purdue faculty is among the best in the nation, and I would recommend their services to any Indiana business in need of technical assistance. The direct, immediate result of the IN-Mac support is an initial order of over $110,000 in tooling and $150,000 in parts currently outsourced in China. The growth prospects within 12 months are for 3-5 times that annual salaries) within the next 12 months as a result of this program. The benefits to the organization go beyond the measured results of this particular project. This process has been re-used in other areas of the business to generate discussion on planned changes which resulted in positive changes to the implementation plan. This partnership with Purdue was much more than an academic exercise. The team engaged in a way that showed their desire to challenge and help Paragon improve our business and operational practices, as is evident in the results realized.